I’m taking the Healthy train to Healthsville, but know this, I don’t wanna be on that train if all that’s being served in the dining car is boring, flavorless food; nor would I make you take that boring train ride with me...I like you that much! 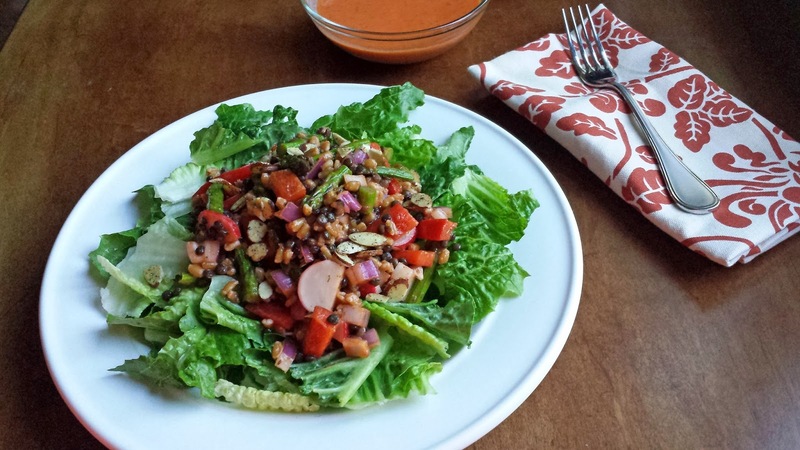 Farro Lentil and Vegetable Salad sure ain’t boring, no way no how! Farrow has kind of a nutty flavor and has a fun chewy texture. Black lentils aren’t just pretty, but they have a peppery flavor and a firm texture that makes them perfect to add into salads. And all those veggies, make the salad colorful as well as adding tons of interest and flavor. Farro is an excellent source for complex carbohydrates, is high in fiber, and protein, it has been found to stimulate the immune system, lower cholesterol and help maintain blood sugar levels. 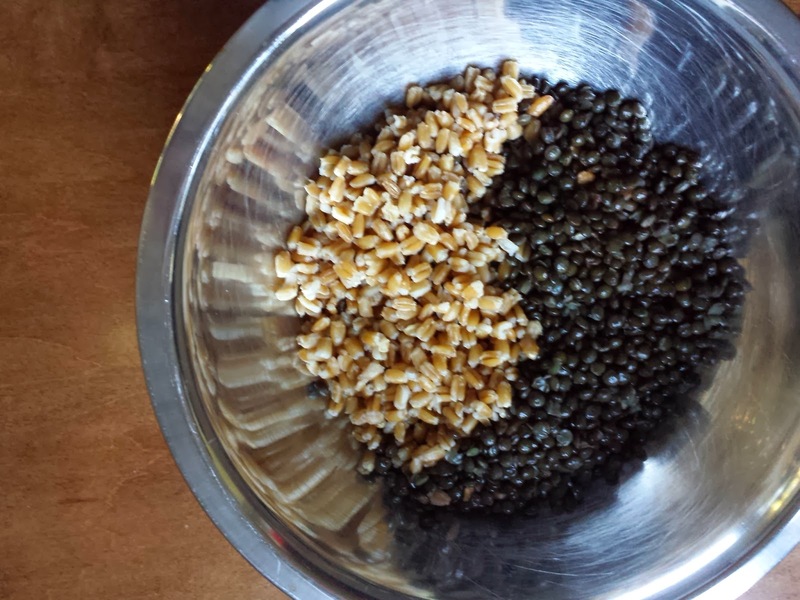 Black lentils are also high in protein and fiber, as well as containing Anthocyanins (also found in blue berries) which may have memory boosting and cancer fighting properties…I must remember to eat more black lentils. And the veggies…Mom didn’t tell us to eat our veggies for no reason! Listen to your Mother! 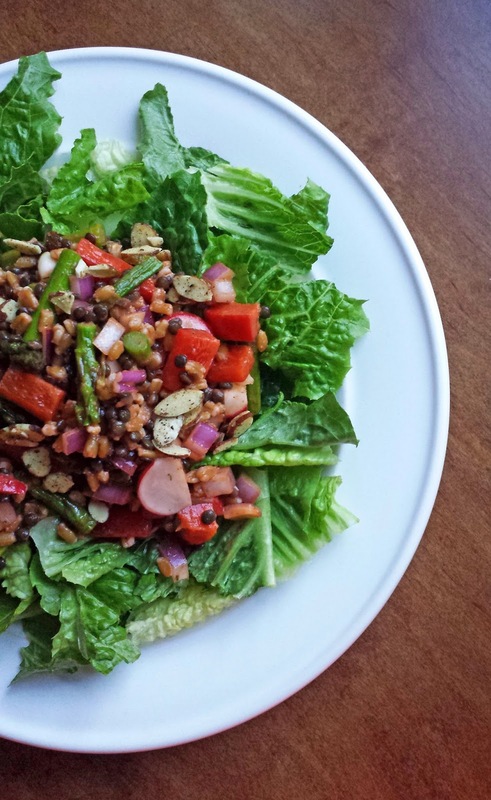 Farro Lentil and Vegetable Salad is totally versatile; top it with cubes of cheese, with fish or steak. You can even skip the lettuce and serve it warm as a side dish. Choo choo…Here’s what you do. Put the farrow and lentils in a medium bowl. I used black lentils which have a peppery flavor, they've been cooked for about 2 minutes left than the package stated so that they retain their shape. Cut up a bunch of Cooked Asparagus, red (or orange) bell pepper, radishes and onion. Add the veggies to the bowl with the farro and lentils; pour a little vinaigrette over the top and give it a toss. Roasted Tomato Vinaigrette is super tasty and low in fat, but you can use whatever you have. Make a bed with some lettuce and mound the farro, lentil, veggie mixture in the center, sprinkle a few toasted sliced almonds and serve more vinaigrette on the side. You may choose to top Farro Lentil and Vegetable Salad with some Pecorino Romano cheese, with a good quality canned tuna or salmon, or with seared fresh tuna or salmon, or with a grilled steak. 1 cup Lentils, that have been cooked for about 2 minutes less than the package directions, and drained. 1. In a medium bowl add the faro, lentils, asparagus, bell pepper, onion, radishes, ¼ cup of vinaigrette, and salt & pepper to taste; give that a toss to combine. 2. Make a bed with the lettuce on either a platter, or on individual serving dishes. Mound the faro, lentil mixture in the middle, of the bed of lettuce and garnish with the almonds. Serve extra vinaigrette on the side. Notes: This salad is delicious and nutritious as is, but you can also top it with a little Pecorino Romano cheese, good quality canned tuna, with seared salmon or tuna, or with a steak. You may omit the lettuce and serve this warm as a side dish as well.